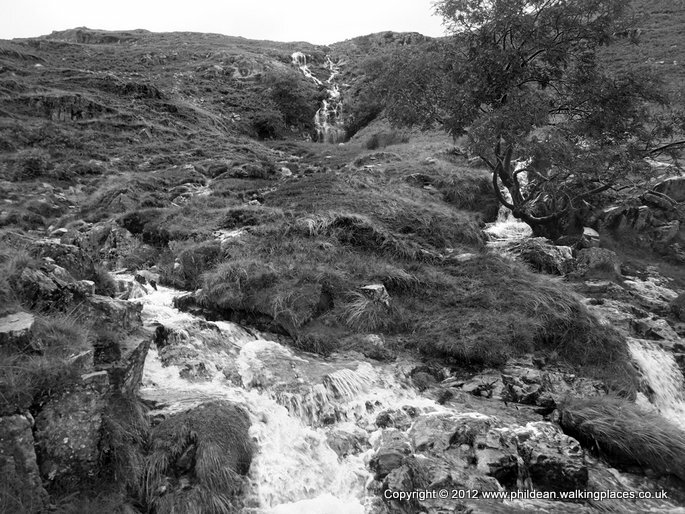 There was a certain feeling of déjà vu as the water poured off the side of the hills over our boots .Poor Nige had only enjoyed the comfort of dry feet for about half an hour before the telling squelching noises started. 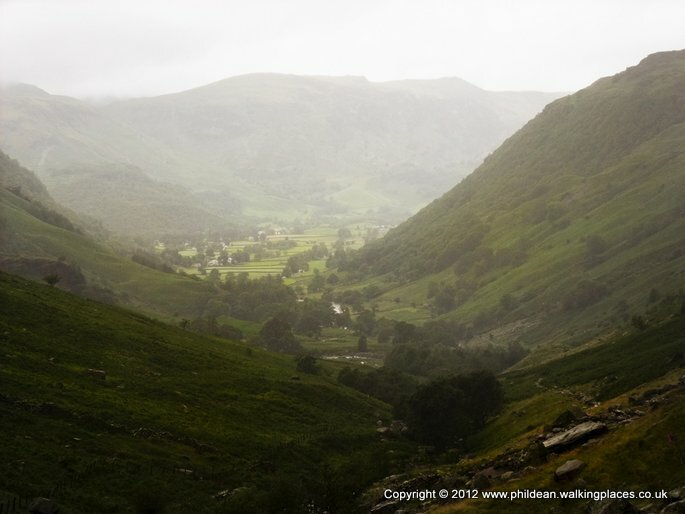 Nevertheless, the views back down to Borrowdale were beautiful made all the better for being shrouded in mist and cloud. Although we knew we’d be in Grasmere by lunchtime if we continued walking at this speed there wasn’t really anything else we could do. 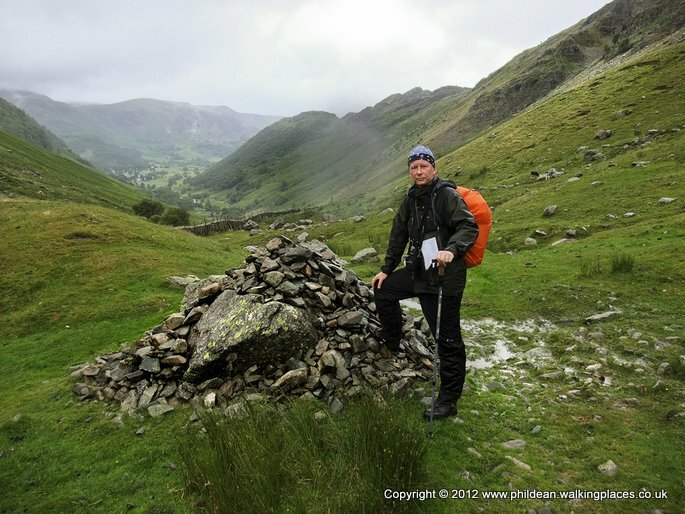 There was no shelter to stop and have a drink and snack so we just plodded on towards Lining Crag which the book promised would give us spectacular views of Scafell and back to the coast. One of the most dramatic views was looking over the drumlin basin. Eventually we reached to top of Lining Crag which we both found quite a climb. Only time for a couple of snaps as the rain was really driving in at this point so we continued along Greenup Edge relying more and more on the gps as the path seemed to disappear under water and bog. 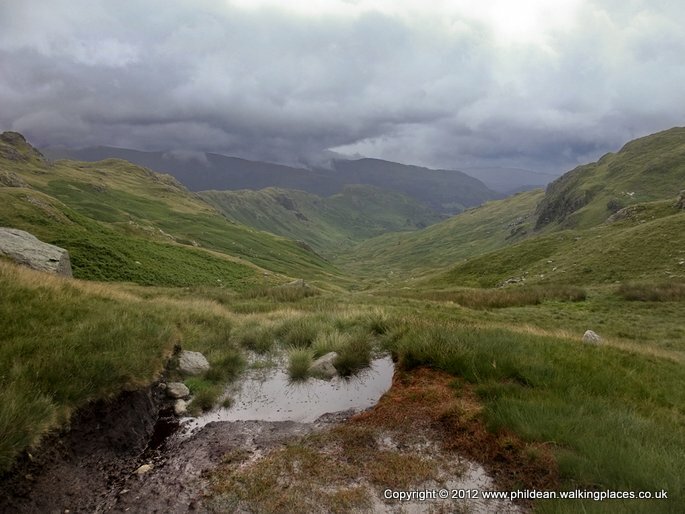 Eventually we came to two posts close together where the route split between high and low and it was with heavy hearts that we took the easterly path down the low valley walk and Far Easdale. We accepted our fate but couldn’t help glancing up occasionally at the high ridge to our left where, on a clear day we would have been. Our biggest fear was that once we had gone past the point of no return and chosen the low route, the cloud would disappear and we would be kicking ourselves that we hadn’t risked it. However, if anything, it got lower and lower so some consolation that we had done the only thing possible in that weather. 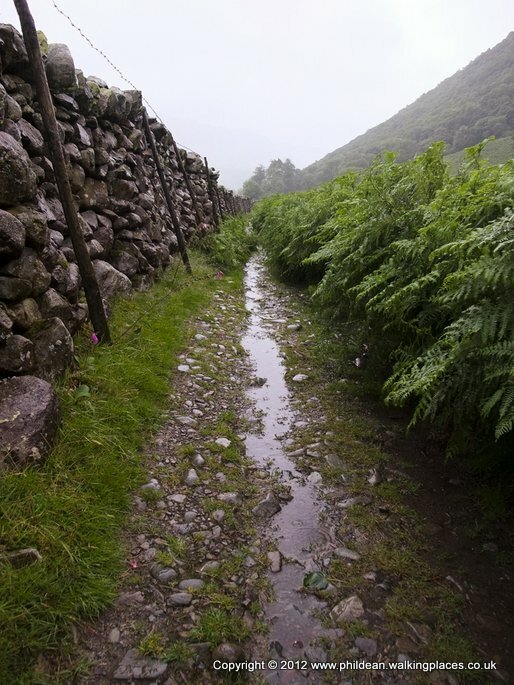 The low route was actually very scenic, following Easedale Beck all the way into Grasmere. As predicted, we arrived early afternoon so we sat on a bench in the main part of town and watched the day trippers filing in and out of the shops and cafes. Suddenly the sun came out and we looked at each other with a wry smile. No time to waste as wet hats socks and other gear was strung out over the back of the bench. We did lower the tone of the place a bit but needs must. Arriving in Grasmere we noticed our mobile phones were receiving all the backlog of texts that we hadn’t been able to pick up for the last couple of days. Like a couple of teenagers (but with reading glasses on) we spent a good half hour staring at our phones, replying to friends and loved ones. 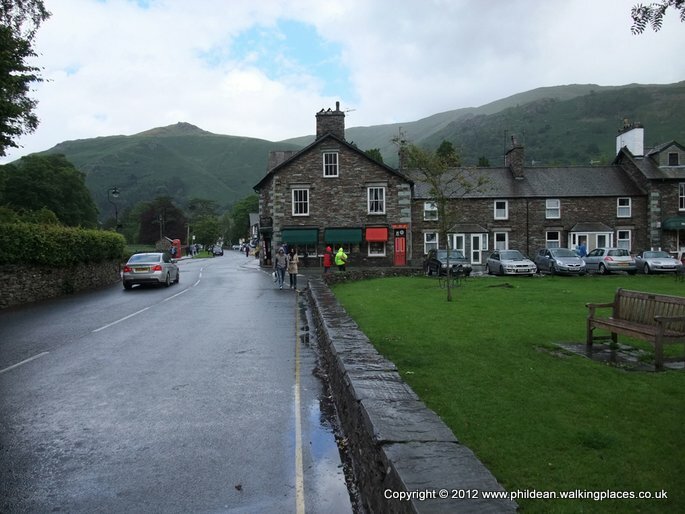 The packed lunch from Stonethwaite farm had been a bit of a disappointment so we popped into a café and ordered some hot food and cold drinks. 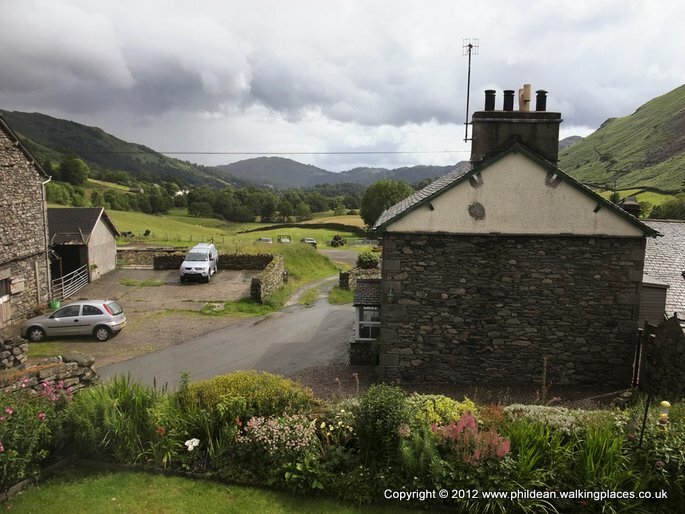 We were spending the evening at Town Head Farm which was about a mile outside the centre of Grasmere but conveniently positioned right by the start of the path for the following days walking so we heaved our stiffening limbs out of the comfy café chairs and wound our way via the back lanes to our digs. We did have a little wobble on the way taking the wrong path at a junction after asking a 7 year old boy which was the way to Town Head Farm but eventually we found ourselves on the farm doorstep being given a very warm welcome. Before we were allowed inside though we were directed to a barn and instructed to remove boots and waterproofs and hang them on the washing lines strung from the rafters. There was a pile of newspapers provided for us to stuff in our boots to aid drying much to Niges’ relief. 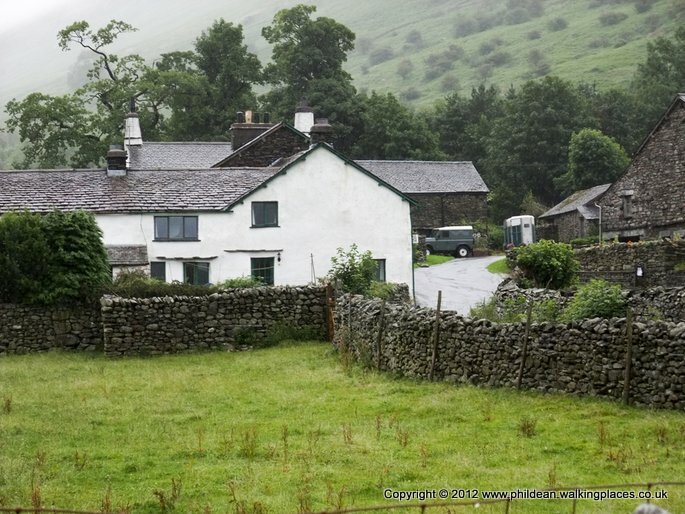 Although a working farm the accommodation was really cosy and welcoming. We were given the tour downstairs including the lounge / dining room where we would breakfast the next morning. Homemade cakes and hot drinks were on a table in the corner and it seemed rude not to partake after all the trouble the hostess had gone to make them look so appealing. We felt ourselves sinking into the comfort of the big settees that surrounded a large flat screen TV and it was only the weather forecast coming on advising us of heavy rain for the next few days that snapped us out of the false paradise and back to the harsh reality of what lay ahead. We showered and Nige re-packed his suitcase which gave me time to take a couple of photos of the room and the view from the window which showed ominous dark clouds building once again in the distance. Not easily discouraged, we were in good spirits as we left our electricals to drain power from the farm whilst we made the short walk up the road to the Travellers Rest Pub. Food was served in a formal dining area which seemed a bit stiff after the days activities. I spotted a couple sat by the window reading the Steadman guide and folding and unfolding an OS map so, when Nige popped off to the gents I went over and asked them if they had decided which route they were going to take in the morning as there was a choice. It turned out they were from Holland and we spent quite a time talking about the Coast to Coast walk. Merlisse and Paul were two of the friendliest people I have come across on any walk and luckily, from that point on our paths crossed regularly until we reached Richmond where they had a rest day. After draining our fourth pint and single malt we said our goodbyes and ambled back in the pitch dark to the Farm. I managed to get a very weak signal from the dongle and jotted down a few thoughts. 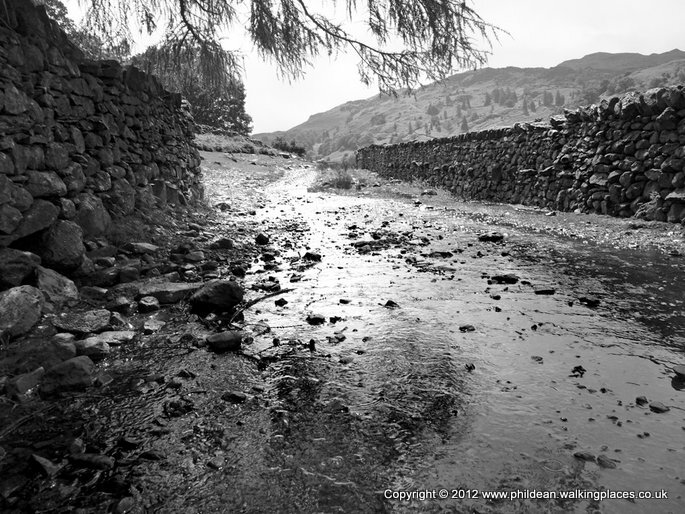 Today we were woken up in Stonethwaite by the roaring sound of the river and the rain on the cottage roof. A sympathetic look from the landlady said it all. Another cooked breakfast later we dragged ourselves off up lining crag for a supposedly 'easy' 10 mile walk into grasmere only to find ourselves again stuck in low cloud clomping through marshland. I've never seen so much bloody water - it's everywhere. Our coats won't dry out and nige says we've got that 'old man' smell about us already - great. Staying outside Grasmere tonight - pub is over a mile away just incase we need some practice walking. Trying to keep to the max 4 pints a night but struggled last night as we moved onto the whiskeys for medicinal purposes (nige has a small blister). 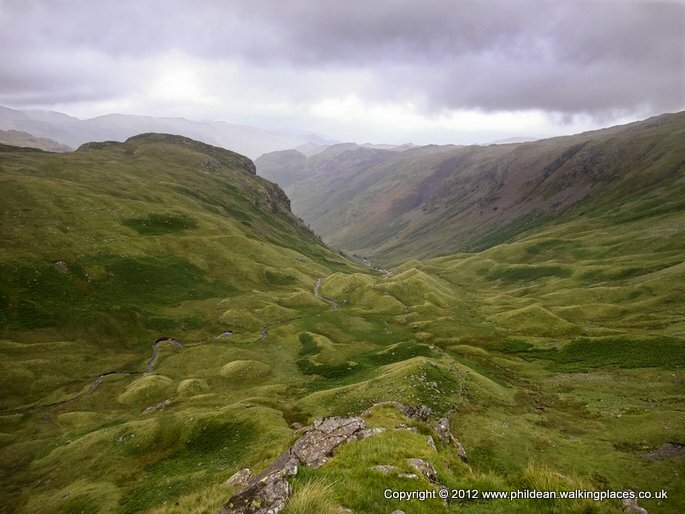 Last day in the lakes tomorrow and REALLY want to do striding edge but forecast won't allow it. This wasn't how I imagined the experience would pan out but for all the tongue in cheek moaning I'm loving (nearly) every minute. As you are on my c2c contact list I'm afraid you may get quite a few of these updates so watch this space. Would love to attach photos but nige only has a weak dongle so I don't want to risk it.